Likes- Jumping, getting her own way and being with her friends, eating grass. Dislikes- following the rules, eating hay and haylage. 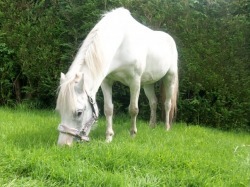 Maisey came to us as we lost one of our favourite ponies Snowy. She was outgrown by her previous owner. 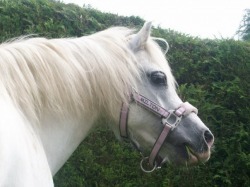 Maisey is a good first and second pony as well as a leadrein pony. She has competed in dressage, showjumpind and cross country as well as showing class both ridden and inhand. She currently needs more work to develop her top line. We hope that Maisey will continue to compete in all these spheres and with some more work to develop her top line she should do well. Maisey has just come back from her fattening holiday as a companion pony so she has put on lots of weight which she finds difficult to do when being stabled due to her crib-biting. We will be lunging and long reigning her to get her back into shape and she will be joining in on a Saturday morning as soon as possible! Maisey is back in work and is holding her weight much better than before. Unfortunately as there is no grass at this time of year she has bucket feeds which keep her fat but give her far too much energy!